Come back to the Named Lands in this compelling sequel to Ken Scholes amazing novel "Lamentation." It is nine months after the end of the previous book. Many noble allies have come to the Ninefold Forest for a Feast in honor of General Rudolfo's first-born child. Jin Li Tam, his wife and mother of his heir, lies in childbed. As the feast begins, the doors of the hall fly open and invisible assassins begin attacking. All of Rudolfo's noble guests are slain, including Hanric, the Marsh Queen's Shadow. And on the Keeper's Gate, which guards the Named Lands from the Churning Waste, a strange figure appears, with a message for Petronus, the Hidden Pope. Thus begins the second movement of The Psalms of Isaak, "Canticle. KEN SCHOLES is a winner of the Writers of the Future contest whose short stories have appeared in various magazines and anthologies since 2000. His first novel, "Lamentation," debuted from Tor in February 2009. 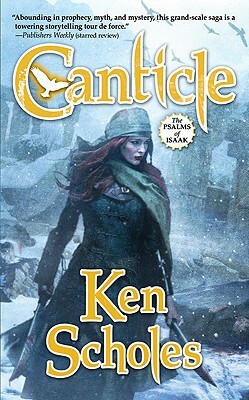 Canticle was the second and Antiphon is the third of the five-book series, "The Psalms of Isaak." Ken grew up in a small logging town in the Pacific Northwest. He has honorable discharges from two branches of the military, a degree in History from Western Washington University, and is a former clergyman and label gun repairman. Ken lives near Portland, Oregon, with his wife Jen West Scholes, and their twin daughters.